Brief Reactions: IS magically multiplies? This morning the BBC explained that the CIA has just revised its estimates about the fighting strength of IS (aka ISIS aka ISL). They suddenly have three times more fighters than we first thought. I can think of very few kind ways to process this news. (1) Given that the Agency’s track record of periodic and stunning failures (Nairobi bombing, 9/11, a nuclear Pakistan), perhaps this is another admission of rank incompetence. (2) President Obama essentially declares war — or rather, direct military action (war would require a real vote in Congress) — on IS. A few days later the CIA says, “Oops, there are three times the number of militant soldiers than we first thought”. Even if this claim were true, it would be hard to escape the impression that the administration is ginning up evidence to justify an expanded war. I would prefer to believe the first option. Unfortunately, after the utterly dishonest handling of the chemical weapons claims last fall, I find it difficult to reject the second option as mere paranoia. Several days ago, like the rest of the world, I heard that ISIS had destroyed the grave of Jonah (yes, as in, Jonah and the whale). In all honesty, like the rest of the world, I had little idea that he grave was supposedly in Mosul. This short piece is a sharing of my own efforts to learn what was lost. The modern city of Mosul lies in the north astride the river Tigris. In short, it is the historical twin city to Nineveh, the ancient capital of the Assyrian empire. The Babylonians destroyed Nineveh in 612 BC when they overthrew that empire, and a new city, Mosul (al-Mawsil), arose on the opposite bank of the Tigris. I have noticed that news sources sometimes try to disassociate the cities (saying that Nineveh is “nearby”, or similar). Perhaps the writers in question lacked the diligence to consult a map. Perhaps a diminished connection to ancient Nineveh suited each article’s obligatory paragraph attacking the historicity of the site. In any case, the remains of Nineveh’s western wall stand barely half a mile from the center of old city Mosul. Apart from the archaeological park, which is plainly visible from a satellite photo, the ruins of Nineveh are completely enveloped by the northeast suburbs of modern Mosul. The site of the Nabi Yunus (prophet Jonah) mosque, was a few thousand feet south of the Mashki gate and modern archaeological park, on a hill known locally as Tell al-Tawba (the “hill of repentance”). Once upon a time, it would have been part of the western wall of Ninevah. For most of the Christian period of the city, which started in the late 1st or early 2nd century AD, it had been a church or monastery. M. Streck’s old entry on “Ninawa” (Brill’s First Encyclopedia of Islam, originally published in 1927) is worth reading because it sets the stage for recent events. The site remained in Christian hands even after the Islamic conquest; the first mosque was built on the hill sometime in the 10th century and the site finally changed hands after the Mongols took control of Mosul in the 13th century. Christian and Muslim alike venerated the tomb. Indeed, the 10th century Arabic geographer al-Muqaddasi said that seven pilgrimages to Nabi Yunus in Nineveh were as valuable at the great pilgrimage to Mecca. This sort of background is needed if one wants to appreciate news coverage of recent events. Official statements from ISIS claim that the mosque was destroyed to purify Islam from perceived idolatry. Not surprisingly, news coverage has, on the main, treated the event as an affair between Muslim sects (cf. Telegraph, Time, NPR, Washington Post, to take a quick sampling). The odd thing is that most fail to observe that the mosque was a Sunni holy site. ISIS Islamists are also Sunni. This should not be confused with the Sunni vs. Shi’ite violence so common to Iraq. Some, however, have noted that this is equally an attack on what little Christian community remained in Mosul. Nabhan’s Wall Street Journal article is useful as is CNN’s interview with Dr. Candida Moss from the University of Notre Dame. She also co-authored a CNN blog post with Joel Baden from Yale Divinity School in which they lay out the argument in greater detail. In short, because the site had a long Christian history and because Christians see Jonah as a prophetic anticipation of Jesus’ death and resurrection, the destruction of Nabi Yunus should be understood primarily within the context of the religious cleansing taking place in Mosul. This makes good sense, provided one knows the history of the site and takes the time to learn about the recent history of Mosul. Before the U.S. invasion in 2003, Mosul had a Christian population of roughly 130,000. By the time ISIS overran the city, only about 10,000 remained. It is not hard to understand why. Mosul had seen frequent outbreaks of Islamist aggression against Iraqi Christians over the last 10 years. One may find a compilation of the more infamous atrocities on Wikipedia. The fall of Mosul to ISIS was the final calamity for the remaining community. I will not outline ever detail here. Those interested may refer to the timeline provided by the Assyrian International News Agency. They closed, desecrated, and destroyed the remaining churches. Christians were given a deadline to convert, pay the jizya tax, or flee. 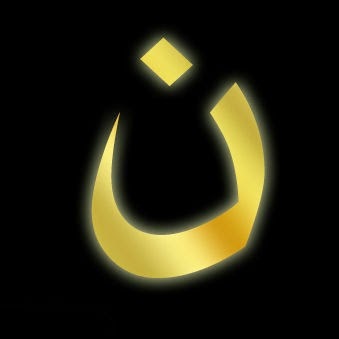 As the deadline approached, ISIS marked Christian houses with the Arabic letter “N” for “Nazarene”. (If you travel in the right Facebook circles, you have seen friends changing their picture to a stylized version as a sign of solidarity and protest, pictured to left.) As Christians fled the city, numerous reports indicated that they were robbed of all but the clothes on their backs (compare, for example, the Guardian, Breitbart). Interviewed survivors and church officials indicate that return is unthinkable as long as ISIS controls the city. Patriarch Louis Raphael I Sako, head of the Chaldean Church, summed up the situation simply: “For the first time in the history of Iraq, Mosul is now empty of Christians“. Given that the city’s inhabitants converted to Christianity some 1800 years ago, that is a stunning and tragic statement. It is also the final stage of a religious purge that has a 10 year history. Nuns from Maaloula set free! Rumors have been circulating all day that the nuns have been set free, but we now have visual proof. Even if you don’t understand Arabic, the scene of their safe return to Damascus speaks for itself. Yesterday I raised concerns about early reports from the renewed combat in Maaloula. Sadly, confirmation of those initial reports has begun to emerge in today’s news cycle. Based on interviews with the Vatican’s ambassador to Syria, The Daily Star is confirming that up to 12 nuns have been abducted from the Greek Orthodox Monastery of St. Thekla and relocated, most likely to the village of Yabroud (about 30-45 min NW). AsiaNews adds some additional details of unstated source. Given that the Catholic Patriarchate is located less than half a mile from the Orthodox Patriarchate on the same street, there is a high probability that this statement came from credible information shared between the two churches. The Daily Star article also cites claims by opposition forces that they entered the convent merely to protect the nuns from the hostile Assad regime. Given al-Nusra’s history of violence against Christians and the fact that they rained explosive-filled tires down on the village, this claim is patently absurd, especially given that Assad has a history supporting the Monastery and making personal visits. Most of the English-language news so far has ignored the preposterous element of rebel claims, but nevertheless taken then at their word that the nuns are still present at the Monastery, preferring to label them as hostages (cf. Bloomberg, Reuters, AP via Fox). Given the degree to which the western press agencies trust the pro-opposition activist Rami Abdulrahman, a.k.a. the Syrian Observatory for Human Rights, for their information, it is possible that they are taking his agnostic approach to the initial conflict reports. Certainly they have copied his analysis, repeating that the assault is strategic, based on the need to control a major N-S freeway near the village. Had they bothered to check a map, they might have noticed that the village is separated from the freeway by a good 7 miles of winding, dusty road and that another village, Ayn At-Tina, stands far closer. Another 8 miles SW (though at a much lower, less strategic elevation), Qutayfeh lies directly adjacent to the freeway. Earlier today The Daily Star (a Lebanese paper) was one of the first English sources to break the news. The Syrian Observatory for Human Rights copied and pasted their work (changing only the spelling of the village) and the story is now beginning to get wider media exposure at AP, NPR, and elsewhere. The derivative stories focus more on the greater context of the battle to control the Qalamoun Mountains, which are strategic to supply lines for both sides. Sadly, this means that initial reports of a great tragedy are passing in silence. Multiple Arabic Facebook pages are reporting that the Islamists have seized control of St. Thekla’s Monastery and have kidnapped the nuns and the soldiers who were guarding them. Reports claiming to come from foot soldiers stationed in Maaloula indicate that the opposition forces are destroying the convent. All indications are that the girls from the Monastery orphanage and the younger nuns under 60 were relocated to a safer location before the latest outbreak of violence. The Mother Superior and the older nuns chose to stay and there whereabouts not certain. Those whom I have been able to contact in Syria fear the worst. I point out in full candor that my information is fragmentary and hearsay. That is the nature of information from an active war zone. That said, I would rather express watchful – and perhaps on some points, overly hasty – concern than wait for a media cycle dominated by football and consumerism to turn its attention to the fate a few pious elderly women who stood their ground against al-Qaeda in one of Christianity’s oldest and most venerable monasteries. Saidnaya: another Maaloula in the making? 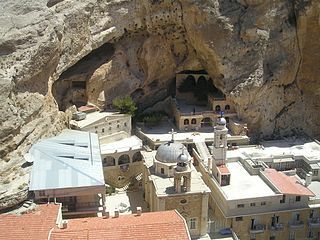 It appears that the Islamist opposition forces who wrecked havoc in Maaloula may be preparing for a similar assault on the equally important Christian village of Saidnaya. On Oct. 1, Fides (a site of the Vatican news network) reported that raids were now commonplace and that one man was dead after clashes the previous day. The “committee” mentioned in the article is a local militia comprised of citizens from the village. These have, alas, become commonplace. Pravoslavie (a Russian Orthodox site) provides further context, including mention of previous attacks on the city’s famous convent. One less reported claim from Maaloula was that al-Nusra and company had taken the Safir Hotel back in March and had been harassing the villagers regularly prior to the major assault on September 4th. It is a disquieting precedent and it comes on the heels of an announcement that opposition forces are planning a major attack through the Qalamoun mountains, the range which is home to Maaloula, Yabroud, and Saidnaya. Saidnaya lies about 30-40 minutes to the south-west of Maaloula along the very same road that Muslim extremists used in their initial suicide attack there. It was, in happier times, one of chief tourist and pilgrimage sites in Syria. The village is predominantly Christian and contains many ancient and important churches. Our Lady of Saidnaya convent dominates the landscape. The Roman emperor Justinian I (ruled 527-565) laid its foundations and it claims to be home to one of the four original icons of the Virgin Mary painted by St. Luke. Cherubim convent sits atop the adjacent mountainside. St. Ephraim Monastery, home to the Syrian Orthodox community’s Patriarchal for teaching Syriac, lies at the edge of town. I should add that heavily fortified monasteries usually exist for obvious geopolitical reasons. The main N-S freeway connecting Daraa, Damascus, Homs, Hama, and Aleppo also runs through this region, following the basic contour of ancient trade routes. The hills SE of Saidnaya are also home to a number of military facilities and an infamous political prison. Despite these obvious military targets, it deserves notice that the first shots fired in Saidnaya were directed against a church.